While the data is very clear, it does not effectively paint a picture of what it is like to live below the poverty threshold. The official poverty line in the United States in 2019 is $12,490 per year for an individual, and $25,750 per year for a family of four.³ It is difficult for most people to imagine trying to make ends meet on this budget, much less sustain any quality of life. Yet thousands of our neighbors live in these conditions every day. The effects of such poverty far exceed financial difficulties; over the next several months, we are going to discuss the broad toll of poverty in the lives of those who experience it. This week, we will briefly share the correlation between poverty and life expectancy. A Harvard analysis of 1.4 billion Internal Revenue Service records on income and life expectancy that showed staggering differences in life expectancy between the richest and poorest also found evidence that low-income residents in wealthy areas, such as New York City and San Francisco, have life expectancies significantly longer than those in poorer regions. While those differences can be chalked up, in part, to healthy behaviors — low-income residents in New York City smoke and drink less, exercise more, and have lower rates of obesity than the poor in other cities — it’s unclear what other factors might contribute to the difference, said David Cutler, the Otto Eckstein Professor of Applied Economics and a professor at the Harvard Kennedy School and the Harvard T.H. Chan School of Public Health. Among men, that gap is 15 years, roughly equivalent to the life expectancy difference between the United States and Sudan. For women, the 10-year difference between richest and poorest is equivalent to the health effects from a lifetime of smoking. Clearly, there is a correlation between income and life expectancy across the board, but two aspects of this study’s findings are of particular interest. 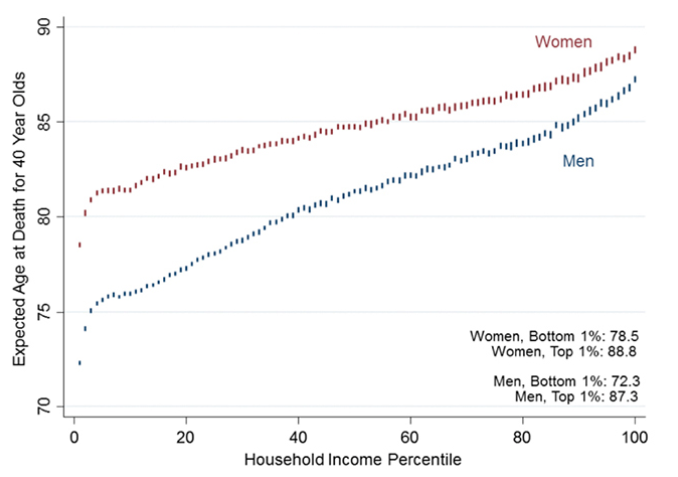 First, the degree to which income affects life expectancy in the United States is shocking. One might expect a few years difference between the richest and the poorest, but a ten to fifteen year margin between socioeconomic classes is incredibly significant. Second, it is intriguing that this effect is mitigated somewhat by the affluence of the community surrounding a given poor individual. 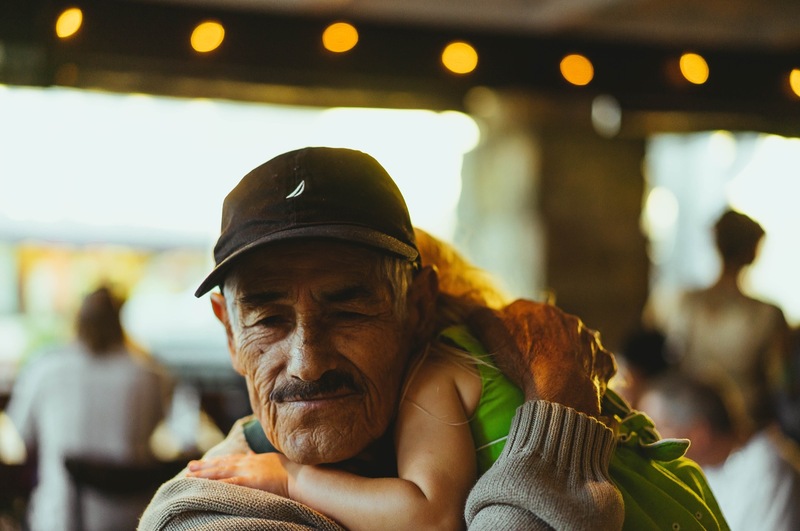 The study cites longer life spans for the poor of San Francisco and New York, ostensibly attributable to the uncommon wealth of these communities. Unfortunately, this trend bears out negatively in Winston-Salem.With median household income well below the national average, the effects of Winston’s disproportionately high poverty rates cannot be offset by the combined wealth of the community.⁵ Somewhat unsurprisingly, out of the five major urban counties in North Carolina, Forsyth County has the lowest average life expectancy.⁶ While we have not found any strong data that breaks down life expectancy in Winston-Salem by socioeconomic class, there is no reason to believe that the national trends are not represented, if not magnified, in Forsyth County. It is important to understand that issues such as poverty, income inequality, and economic immobility wholly transcend financial considerations. For many in Winston-Salem, their socioeconomic status is a matter of life and death. In the city hardest to escape child poverty, you can bet that people are literally dying and losing years off of their lives because of their economic situation. If this isn’t a wakeup call for us, what is? ¹ Chetty, Raj, and Nathaniel Hendren. “Data from Chetty and Hendren (2015): Causal Effects, Mobility Estimates and Covariates by County, CZ and Birth Cohort.” Equality of Opportunity, Harvard University. 2015, http://www.equality-of-opportunity.org/index.php/data. ³ “U.S. Federal Poverty Guidelines Used to Determine Financial Eligibility for Certain Federal Programs,” Office of the Assistant Secretary for Planning and Evaluation: Health and Human Services, last modified February 1st, 2019. Accessed March 16th, 2019. https://aspe.hhs.gov/poverty-guidelines. ⁴ Reuell, Peter. “For Life Expectancy, Money Matters.” The Harvard Gazette, Harvard University. 2016, https://news.harvard.edu/gazette/story/2016/04/for-life-expectancy-money-matters/. ⁶ Richard Craver/Winston-Salem Journal, “Forsyth County Life Spans Lag behind Other Urban Counties,” Winston-Salem Journal, accessed March 13, 2019, https://www.journalnow.com/news/local/forsyth -county-life-spans-lag-behind-other-urban-counties/article_8b2075d4-873b-56a8-9cdf-49746a96a5e5.html.